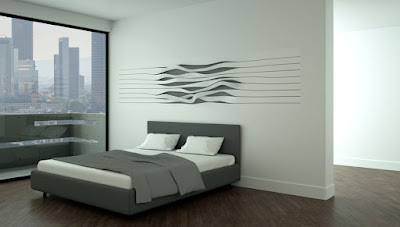 The wall-system Fessura merges sculpture and furniture into a unique decorative panel designed for residential and commercial interiors. Fessura creates a tridimensional and dynamic effect using high-end details and materials. Despite the seamless appearance, each component has been strategically designed for a modular and easy assembling. Fessura consists of nine modules made by LG Hi Macs solid surface and can be installed on existing walls or in continuity with drywall sheets. The design is the result of advanced algorithmic techniques which guarantee flexibility and customization and generate precise data for digital manufacturing. Elegance and technology make Fessura an exclusive piece, protagonist of a contemporary space. Fessura, a project developed by A>T Studio, was designed with Rhino and Grasshopper. A preview of Fessura will be exhibited at DAMA (Corso San Gottardo 19, Milano) from April 4 to 9, during the Fuorisalone 2017. Also, on April 7th, from 18.00 to 19.30, Arturo Tedeschi will introduce Fessura at "Industry 4.0 & Design Week: talking about the future" at DAMA (Corso San Gottardo 19, Milano). Register for this free event.